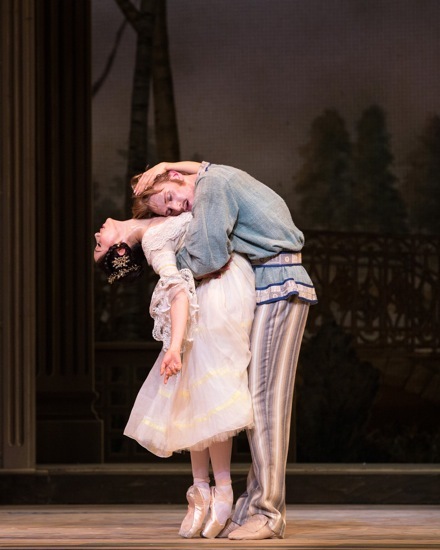 American Ballet Theatre’s new production of Frederick Ashton’s “A Month in the Country” on a program with Mark Morris’s “Drink To Me Only With Thine Eyes” and George Balanchine’s “Symphony in C.” Metropolitan Opera House, May 21-23. Frederick Ashton’s A Month in the Country distills the five acts of Ivan Turgenev’s eponymous play and the passage of several weeks into 40 minutes of dancing, during which a summer wind blows erratically through a country house, stirring passions to life. It’s a wind quite different from the one that agitates the drawing room curtains and wafts the kite belonging to Kolia, the little son of the house, into the air. When Britain’s Royal Ballet premiered the work in 1976, Lynn Seymour played Natalia Petrovna, the wife and mother of the family, and Antony Dowell was Belaiev, the young tutor engaged for Kolya. (The memory of their performances refuses to leave me.) Dowell, along with Grant Coyle, staged American Ballet Theatre’s new production. For only four performances, wedged into ABT’s seven-week bounty of full-length classics, A Month in the Country is flanked by Mark Morris’s Drink To Me Only With Thine Eyes (created for ABT in 1988) and George Balanchine’s Symphony in C (choreographed for the Paris Opera Ballet in 1947 and given its American premiere in 1948 by Ballet Society, later New York City Ballet). A program made in heaven. In Ashton’s ballet, the events that create a tumult in this Russian household occur in the space of a single day. The huge windows in Julia Trevelyan Oman’s elaborately detailed country house open on what might be an elevated viewing platform for surveying the gardens. The weather may be hot, but this is the 1850s, and most of the inhabitants are well-clothed (also by Oman). Natalia; Kolia; Natalia’s elderly husband, Yslaev; their ward, Vera; Natalia’s domesticated admirer, Rakitin; and the maid, Katia, wear light-colored versions of what they might wear in Moscow or St. Petersburg during the winter (albeit with shorter skirts for the women). The footman, Matvei, is in livery. Belaiev departs at the end of the ballet in a summer suit and hat, although for most of the ballet, he wears only a light blue peasant shirt with his striped trousers. It’s clear from the opening image that these are people of leisure. Natalia (Hee Sao in the cast I saw) lounges on her settee, while Rakitin (Roddy Doble), seated at her feet, leans in to chat with her. Yslaev (Roman Zhurbin) reads the newspaper. Matvei (Sem Sjouke) serves tea. Kolia (Arron Scott) does his lessons at a desk in the rear. Katia (Simone Messmer) enters on some mission or other. Vera (Sarah Lane) plays the piano in an alcove. And what do we hear? Chopin’s variations on Mozart’s “La ci darem la mano” from Don Giovanni (rendered in the pit by Emily Wong). In John Lanchbery’s arrangement, the orchestra (under Ormsby Wilkins) slips unobtrusively into this and the other Chopin pieces that make up the score. The opening music is a sly choice. The practiced libertine of the opera woos one woman and contends with two previous lovers; Ashton’s tutor is something of an innocent, but the three women in the ballet are drawn to him like the proverbial bees to the proverbial honey. Ashton has constructed the ballet with a beautiful succinctness, conveying the story through subtle gestures, looks, and pauses—letting the dancing reveal character and underlying emotions. In their solos, the characters might be saying, “This is who I am; this is what I do.” Kolia performs a tricky dance with a red ball. Natalia’s opening solo shows her to be indolent, a bit flirtatious, even when no one is looking. She woos the air with her pretty, flouncing steps, the twist of her shoulders against her lower body, the arch of her back to show her throat. We learn how pampered and woolly-minded her husband is when he can’t find something he needs; before long everyone has joined in searching for whatever it is; Natalia triumphs, waving a jingling ring of keys in the air. When Belaiev (David Hallberg) walks in, full of life, everything stops for a moment. He is a catalyst, exciting all three women (and the little boy). His solo shows how full of life he is, and the duets Ashton has fashioned reveal how he accommodates to Natalia, Vera, and Katia. Vera, the pert young innocent, pulls him out of a pensive mood. “Dance with me,” she seems to order, and when he lifts her slowly straight up, her feet shiver with the unexpected thrill of it. She tempts him to kiss her, but he refrains. With Katia, he’s completely at home. She pops berries from her basket into his mouth, swings onto his lap and off again; holding hands, they embark on the jaunty folk-dance steps that he has already shown he knows. Natalia has a mysterious allure for him—a beautiful “older” woman to this young university student (although in Turgenev’s play she’s only 29); dancing with her, he matches her extravagance. Ashton, with his uncanny ability to make classical steps convey emotional states, has Natalia flutter along in little bourrées on pointe, while Belaiev follows her, supporting her; against the swelling of Chopin’s music from the piano and the orchestra, her feet come to stand for her rapidly beating heart. It all ends quickly and badly, from the moment Vera sees the two embraced. Belaiev and Rakitin— the admirer that Natalia has both toyed with and discouraged—feel they must leave and let the family storm subside. But the tutor returns for a moment. Natalia, grieving, doesn’t see him kiss the ribbons trailing from her gown and leave on the floor the flower she had placed in his buttonhole. Turgenev’s plot, preceding the melancholy ambiance of Chekhov’s plays, develops, of course, through conversations. It’s amazing with what delicacy Ashton welds the nuances of emotions—restrained and unrestrained—to dance. The ways in which he twists and sways and ornaments classical steps without breaking the mold reveal almost everything you need to know about these people. The rest is up to the performers, and these, for the most part, do excellently well. Seo captures both the perfume and the restlessness of Natalia in her fluent dancing and miming. Hallberg’s impeccable technical aplomb is sensitively shaded by his view of the character. His Belaiev is more innocent than cocksure, and I liked that. When he arrives in the drawing room, he looks thunderstruck, as if he already realizes that in taking on this tutoring job, he may be over his head in previously unimagined ways. Lane’s Vera is a bundle of impetuous adolescent urges that she doesn’t fully understand, and Messmer’s Katia is a country-fresh charmer. Scott manages brilliantly to appear to be a boisterous 10-year-old. Ashton must have made Yslaev older than Turgenev did in order to make it clear from the outset that Natalia’s marriage isn’t profoundly passionate, and Zhurban portrays the doddering master of the house effectively. The role of Rakitin may be the most enigmatic and difficult one; he doesn’t have much dancing to do, and hangs around hoping Natalya will give him some encouragement—a kind word, maybe a kiss. Doble does well enough, but hadn’t yet built a fully rounded character at the performance I attended. One fascinating point this program makes is that there are white ballets and there are white ballets. Both Morris’s Drink To Me Only With Thine Eyes and Balanchine’s Symphony in C guard A Month in the Country like two sturdy angels. It’s not only the white costumes I’m speaking of, but the image of an ideal world of music and dancing. By referring to angels, I don’t mean to imply piety. The disparate styles of the two ballets create atmospheres very much of the earth—one outdoors and one indoors. The music that impels Drink is drawn from Virgil Thomson’s Etudes for Piano—pieces with matter-of-fact titles like “Double Glissando” and “Pivoting on the Thumb.” Morris announces his respect for Thomson by having the excellent pianist, Barbara Bilach, play the first selection onstage, with the instrument’s lid open and no dancers in sight. This ramble through delicate dissonances is a fine introduction to Thomson’s complexities and witty, bold workouts for fingers. From the opening moments when several men rush women across the stage, carrying them horizontally overhead like battering rams, and other dancers bolt into view with bent-legged jumps that land them smack on the whap! of Thomson’s stentorian chords, you sense the robust flavor of this marvel of a dance. The six women are on pointe, but their handsome costumes (by Santo Loquasto) are comfortably draped, and the six men, too, look at ease. There’s no end to the mazy inventions Morris devises. The dancers cross the stage in two lines traveling in opposite directions, each person doing something slightly different. A couple has a lively, intimate exchange on one side of the stage, while four people busy themselves on the other. There’s a lot of passing through, and many buoyant steps. A swatch of three-quarter time sets people sweeping about the stage; soft, light music gets them airborne; thickets of notes make their feet faster. The choreographic picnic plays games with unison, counterpoint, and canon. Yuriko Kajiya darts her feet apart and together in needle-sharp échappés; flanking her, Kristi Boone and Melanie Hamrick make their feet strike out when hers pull in and vice versa. Joseph Gorak (a terrific performer) begins the solo that Morris made for Mikhail Baryshnikov with a whirring pirouette that opens out into a spin with one leg pointing to the side like a compass needle. As the tango rhythms of Thomson’s “Parallel Chords” unfold, James Whiteside joins him to create a canonic duo, and Scott arrives to make it a trio. Men often partner women, and one lovely motif involves couples crossing the space while reaching out now one hand, now the other, to each other, without quite touching. But Morris, as is his wont, occasionally and casually pairs men with men or women with women. Quiet passages of music produce calmer, more restful movement. A dancer can get tired having so much fun. No wonder a man sometimes hurries by with a woman slung over him in a fireman’s carry. And Drink To Me Only With Thine Eyes (the title taken from Ben Jonson’s lovely song, “To Celia”) might justify the ending, with Gorak sitting, Kajiya lying down, and a one or two others standing around. Whether they’re drunk on wine and love or dancing and music, we feel the headiness of their pleasure. When ABT premiered this very egalitarian work, the cast included some major dancers, such as Baryshnikov, Robert Hill, Julio Bocca, and Martine van Hamel. In the current cast, Kajiya, Boone, and Whiteside are soloists, and the other performers are members of the corps de ballet. Polished in Tina Fehlandt’s staging, they all look like stars. If Morris avoids hierarchy in his work, Balanchine honors it in Symphony in C (staged for ABT by Merrill Ashley, who performed it many times as a principal dancer with the New York City Ballet, and Stacy Caddell). Georges Bizet was only 17 when he composed the music in 1855, and he followed the classic symphonic structure of four movements, with the second as the slow one. In each movement, Balanchine deployed a principal couple, two secondary ones, plus eight women in the first movement, six in the second and third, and ten in the last. The white costumes are tutus, tiaras are in evidence, and the 12 black-clad men do their courtly partnering amid a bevy of lower-echelon princesses, who frame and echo obediently. Balanchine creates entrancing patterns in space—from the “London Bridge” passages in the second movement to the forward-and-back meeting and parting of lines in the third and the gradually accumulating frame of women when the fourth movement unites everyone. In this ballet, Balanchine uses repetition as a kind of affirmation. I don’t think I’ve noticed before how crystalline the choreography is, less densely textured than in some of his later ballets. Dancers may repeat one step or combination of steps over and over, as if to make sure you understand it before they move on. There’s a kind of grandeur to that. At the Wednesday matinee performance of Symphony in C, the corps de ballet women seemed not tuned-up quite tightly enough; they danced well but attacked the quicker steps with less impetus than New York City Ballet dancers muster. I very much admired Stella Abrera and Eric Tamm, who led the first movement and Messmer and Jared Matthews who were featured in the fourth. Marcelo Gomes partnered Polina Semionova in the ravishing second movement, and together they wonderfully captured its poignant lyricism, its aura of impossible love. The third, buoyantly athletic movement was danced by two other recent Russian additions to ABT’s roster: Natalia Osipova and Ivan Vasiliev. Osipova is a luscious dancer with a wonderful jump, but Vasiliev must have been having an off night. He, too, jumps excellently, but his torso appears inflexible, and some of his moves to support his partner seemed hasty and unformed. That this superb program could only be seen in four performances spread over three mid-week days was a pity. Multi-act story ballets enthrall audiences, but Ashton’s bittersweet narrative and Morris’s and Balanchine’s beautiful tales of music and dancing nourish the soul. I also attended this performance and agree totally with you about how wonderful (and well balanced it was). I can never get enough of Symphony in C. A wee corection about the number of dancers in each section, however — there is a corps of six girls, not eight, in the 2nd movement. Am looking forward to the Ratmansky trip next week. Am skipping all the classics — have seen too many swans, courtiers, slaves and nymphs in my many years of ballet-going. I’m grateful for Miriam’s correction. I seem not to have been very good at counting women in white tutus (or reading the program carefully). There are 8 women in the first movement ensemble of Symphony in C, six in the second and third movements, and ten in the fourth. I’ve updated my post with the correct count. A pipe, Yslaev’s pipe (not Magritte’s “Ceci n’est pas une pipe”) is what everyone is seeking, and finding in his pocket, of course. A brilliant touch to instantly reveal Yslaev’s age and stage. And how not to be drawn in slyly by the opening “La ci darem”? And how not to have a ribbon pas de deux in an Ashton ballet? Unison in “Drink to Me Only”: Unexpected tiny divergences — a foot, a hand, a lean — within purportedly unison passages, like sprinkles on vanilla ice cream. Slightly ragged lines here and there in “Symphony in C” (so visible from the upper reaches). But the Wed. mat performance overall was a feast. I saw this program on Thursday evening with the same cast. Like Miriam Gross, I can never get enough of Symphony in C. Along with Serenade, it’s probably my favorite Balanchine ballet. This program was well put together and enchanting. I imagine it’s being presented only four times because ABT audiences prefer the full-length story ballets, but the audience I was with was enthusiastic, especially at the close of Symphony in C. As for the Ashton, it was a treat to see it and I thought David Hallberg demonstrated a real affinity for the work and the role. A very well balanced evening at the ballet.